Workfront’s out-of-the-box integrations sync with today’s top enterprise tools and systems, so your team can continue to work with focus, efficiency, and productivity. You aren’t limited to our standard out-of-the-box integrations. 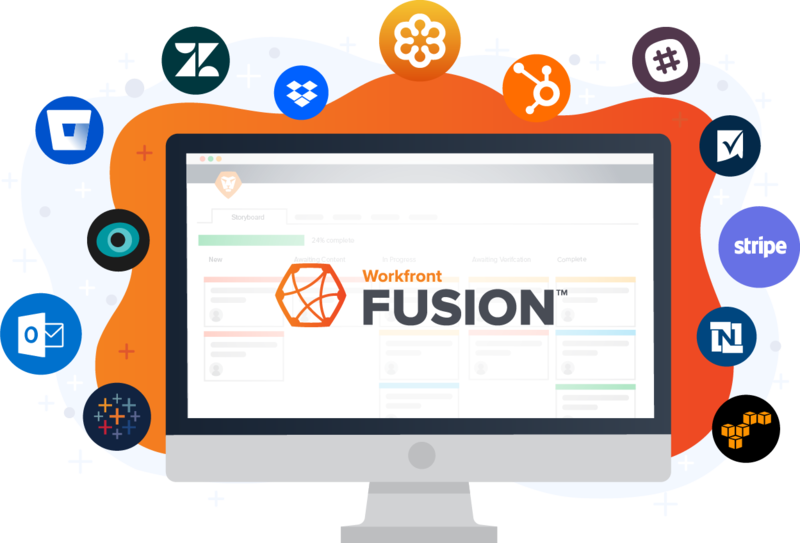 Workfront Fusion lets you customize your Workfront platform with connections to over 100 standard business applications. Save time by updating your projects and tasks without leaving Adobe Creative Cloud. You can upload documents and complete tasks directly from Photoshop, InDesign, or Illustrator. Connect your creative and publishing processes with Workfront for Adobe Experience Manager Assets. Organized experiences and real-time reporting empower your team deliver amazing work faster. Update your tasks, assign new work, and keep track of your team’s projects, in real-time, from anywhere with the Workfront mobile app. Keep your work organized and improve cross-team collaboration by attaching Box files directly to Workfront projects and tasks. Accelerate your document collaboration by attaching Google files directly to your Workfront projects and tasks. Maintain a single source of truth across the enterprise by connecting work completed in Jira to the work managed in Workfront. Turn emails into Workfront tasks, create new work request, and assign work to other people without leaving your desktop or browser version of Outlook. Connect your content to your work to ensure your team always has the most up to date information. This native integration enables teams to enhance collaboration and improve productivity, ensuring the most important work keeps moving. Connect Sharepoint with Workfront to quickly manage and coordinate digital content across teams. Eliminate wasted time and seamlessly collaborate across teams on Workfront projects and tasks without ever leaving Slack. Connect cross-functional teams, improve the efficiency of your sales cycle, and deliver a winning customer experience with Workfront for Salesforce. FCB increased productivity is saving an estimated 1000 hours of billable time. Draeger Medical’s professional services team improved on-time targets by 125%.